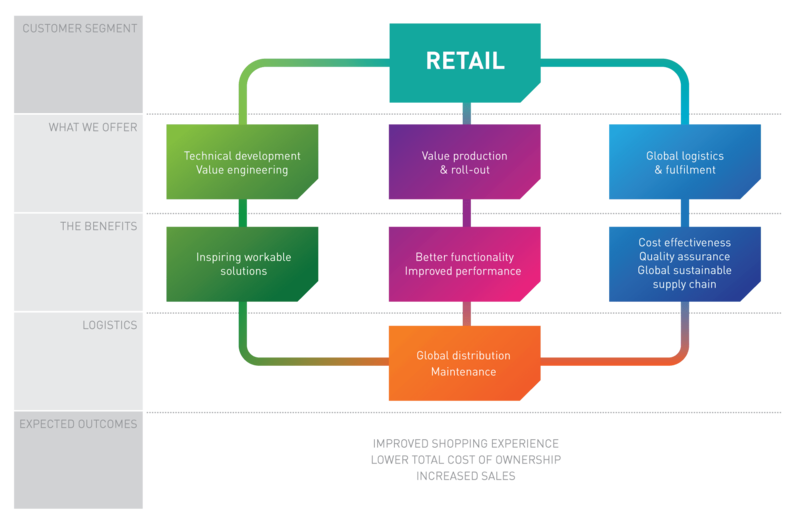 We promise to bring significant savings to your store refurbishment and new concept roll-out programs via our supply chains in the UK, Europe and China. Our centrally managed logistic and fulfilment partners will look after it through to the shop floor for your national, regional and international store portfolio. Given the ever-changing retailing environment, we are always prepared to customise our service to meet your specific needs and support your growth. To provide a retail design which is inspiring and a practical shopping environment. To offer our re-engineering of existing store fixtures/display stand /equipment for better functionality and lower cost. The manufacture of cost-effective and quality-assured merchandising displays from our global supply chain. To implement the agreed concept to transform the shop floor to completion with a lower total cost of ownership. You want to make savings from your existing store fixtures. You want to improve the functionality and the ease of use of your retail design. Your new store concept is too expensive to be implemented. You need more efficiency of rolling out your retail programs. Contact our team who will advise you on how we can implement your ideas while making a saving.